Capital has been outpacing economic growth (and thus wages) since the 1980’s and contributing to a global income gap which then contributes to an increasingly widening global wealth gap. Meanwhile the growth of wealth is lower for workers than it is for company owners, landowners, and stock holders, and those with the lowest incomes tend to extend themselves on credit and debt. While its true that the bottom has been lifted up, this trend could have drastic political, social, and economic consequences in terms of inequality. To get the impact, there is a lot to understand. We cover the basics of this problem of “economic inequality” below and also explain key terms like income inequality and the wealth gap. Below we explain many terms related to economic inequality, and many aspects of the income gap and wealth gap, first let’s do a rundown of where we are at today (TIP: For everything we don’t cover here, there is Capital in the Twenty-First Century By Thomas Piketty Explained). As of 2017 there is a big wealth gap between the bottom 80% and top 20%, between the 99% and 1%, between the .9% and .1%, between the .99% and .01%, etc. This has been true for a while, but has gotten worse over time (especially since the 1970’s, and even more so since the Reagan era of the 1980’s). In other words, while the bottom has been lifted up in modern times (“a rising tide lifts all boats;” the mantra of neoliberalism), the income and wealth gap is growing (generally creating a political, economic, and social power gap over time as an effect). The general statistics can be confirmed by studies (like this one, see citations below) and simply by looking at data on taxes paid. The effects can be confirmed with studies, a look at history, or with the general use of reason (as the historical effects of inequality in relation to power gaps really have never changed nation-to-nation or era-to-era). This is true not just in the U.S. or other nations, but globally as well. Furthermore, as noted above, the wealth gap grows every year due to the income gap. In other words, income inequality feeds wealth inequality, and over time this results in every increasing wealth inequality. Wealth inequality is almost entirely due to the rise of the wealth of the top 0.1% (the gap grows the greater the closer toward the .001% one gets). While this wealth does “trickle down” to some extent, and public stock markets help to ensure some amount of democratization of wealth sources, nothing is truly offsetting the gap or the consolidation of wealth into the hands of fewer and fewer businesses and families. This isn’t helped by the fact that the rich save more while the majority overextend on credit. After-all, the rich profit from extended credit, owning debt, getting interest payments, and then lending based off of future interest payments (as debt is an asset that can be held as collateral). One might think that taking the credit away would be better, but if the 80% has no money to spend, it could slow the velocity of money and thus the economy. Add to that the fact that America 2017 is considering cutting the estate tax and corporate taxes (see Trump’s tax plan), and we can confirm we have a growing problem nationally. With that said, American Fiscal and Monetary policy aside, the wealth gap problem is global (meaning a single fiscal policy in America is hardly going to solve all the world’s issues). The net effect of all this is further wealth inequality over time as wealth is concentrated into fewer and fewer hands and more and more debt is held by the majority of people (both as personal debt and national debt). The problem with this is not singular, nor is the cause, but generally we can note that extremes of inequality are bad for democracy and generally cause social, political, and economic unrest. TIP: Historically income inequality has led to 1) Revolution/War or 2) Inflation/Hyper Inflation. Don’t take my word for it, just ask Solon, Caesar, Napoleon, or Hitler what spurred on their “revolutions”. Global Wealth Inequality – What you never knew you never knew. Let’s start by looking at wealth inequality for the World. FACT: The bulk of the global .1% lives in the U.S. In other words, there is a global wealth gap, but the U.S. is in a unique position in terms of wealth. Wealth and Income Inequality: The terms generally describes the gap in wealth and income respectively (where income is a short term measure and wealth is a measure of capital assets over time) between labor and capital, between supervisory labor and non-supervisory labor, and sometimes even between countries. Generally the gap between labor and capital is the biggest gap, next supervisory labor and non-supervisory, and finally this is happening inside countries more than between them (although there is a wealth gap between countries as well). In other words, the main problem is the wealth gap between individuals on a global level where the richest are getting richer faster than the rate of economic growth due to capital investments. Meanwhile, the related problem is that economic inequality leads to social and political inequality. NOTE: There is also obviously a gap between capital and capital too, of a group who all manage their assets wisely, on average those with more capital grow their capital faster. Factor in the fact that nations take out debt and labor typically holds the debt, while capital holds the loans and their interest, and that those with capital tend to control policy (SEE: “money in politics”), and we see the mechanics of the wealth gap. The Causes of Wealth and Income Inequality: The cause is simple, everyone wants to see growth each year. The richest control the capital to make this happen, and they do what they can to ensure growth (here we can note 1. money in politics and 2. the current laws result in capital returns growing faster than general economic growth). Everyone’s wealth goes up, but the rich save more and grow money faster, and overtime this leads to a wealth gap (the wealth gap over time is the main problem; the income gap and policy is part of the equation). The details are way more complex, but that is the gist. When the top makes more, it can afford to extend more credit to the bottom, and then not only is there a gap, but the bottom owes interest on debt to the top. Inequality: Equality is a complex subject that can be viewed in many ways. In this case inequality simply refers to the unequal distribution of wealth and income. What is fair and unfair, and whether we should see equality as being about rights or dollar bills is a subject for its own essay. See the relationship between liberty, justice, and equality. Income Inequality: the gap in distributions of income (including capital, assets, investments, etc). Typically it refers to the discrepancy in income over the course of a year. This is also called income discrepancy, it creates an “income gap“. Wealth Inequality: the gap in distributions of wealth over time. It refers to the discrepancy of wealth accumulation over time between entities (individuals, families, groups, nations, etc). This is also called wealth discrepancy, it creates a “wealth gap“. The Problem of Wealth Inequality and the Wealth Gap Over time: Wealth gaps are the real problem, specifically the wealth gap between labor and capital and the gap between supervisory labor and non-supervisory which necessarily follows it (as this incentivizes the supervisors to stay in the labor market). This race for wealth has lifted up the bottom, but the gap between the bottom and top is growing, while the middle is falling away and joining the top or bottom. Today we all have cells phones, and that is amazing! However, the poorest are extended on credit while the class I just touch the bottom of controls the majority of capital assets and has a much higher income from capital. This is a recipe for social unrest over time as interest compounds and the gap widens. Over time we can expect a sort of “dynastic oligarchy” as wealth is passed down though generations without the proper estate and capital gains taxes (we already see this with Walmart and the Waltons; Sam Walton, God rest his sole, is long gone… yet is the top 10 list of Forbes not filled with Waltons? Do these heirs not own the factors of production?). Economic Inequality: describes the gap in both income and wealth, and generally any sort of wealth or income inequality (be we calculated gross or net amounts or factoring in debt and credit or not). Economic Injustice: when the gap creates social injustice (when the gap leads to an oppression of liberty and rights as an ancillary effect). This can be true in the short term, where minimum wage doesn’t provide for basic needs, or true over time where student loans and a mortgage from 2006 lead to oppression today. An example of how economic inequality leads to economic injustice: It was considered just for the Baron to acquire more land each year, and just to pass it down within the family, but generations later the Baron’s family owns all the land, and now the people on that land feel the families absolute control of the land is unjust as it violates their natural liberty and rights, thus it is now just for them to take recourse. This is what Solon had to work against when he created Athenian Democracy. This is OK for the very rich, and helps those burdened by debt, but it is pretty rough for the rest. Economic Justice: Policies that avoid the above example, ideally without violating liberty and rights. Economic Equality: Policies that allow for the equal pursuit of capital and assets in a society, and limits economic inequality without creating injustice. READ: Thomas Piketty’s Capital in the Twenty-First Century for more information on capital and inequality in the 21st Century. FACT: Only about 1/2 of Americans actually pay the income tax. If that doesn’t hint at a problem, don’t worry, there is a lot more telling data to look at. CONSIDER: In America over time the poor have gotten richer, but the wealth gap has increased. Both these effects have occurred at the same time, often due to the same policies. See paradoxical effects. Inequality isn’t inherently bad, but extreme inequality that leads to injustice can be. See Edward Conrad’s theory of inequality for a counterpoint or Carnegie’s for that matter. TIP: See our page on liberty, equality, and justice for more definitions and clarification. TIP: Just because wealth inequality is a major and timeless issue doesn’t mean the solution is the redistribution of wealth (a common and false assumption). That is arguably at best a bandaid, and at worst injustice which creates even more inequality. Still, Global Wealth Inequality is most certainly a problem. Income inequality is the discrepancy in income in the short term (an income gap). Income inequality affects the economy and politics in the short term. Wealth inequality is a discrepancy in wealth over time (a wealth gap). Wealth inequality affects the economy and politics over time. You can see how, when everything is considered, it is wealth that creates powerful special interests and propels future inequality, which in turn leads to injustice, which in turn leads to political chaos. For every benevolent oligarch or aristocrat, there is a less altruistic one. As every society has well known, a little bit of money buys a lot of power, and when power corrupts, it breeds revolution. Now that we have the basic concepts related to economic inequality defined, lets look at both from both a modern and historical perspective. First, check out this (about as unbiased as it gets) PBS overview on economic inequality will help to pull together all the concepts laid out above. 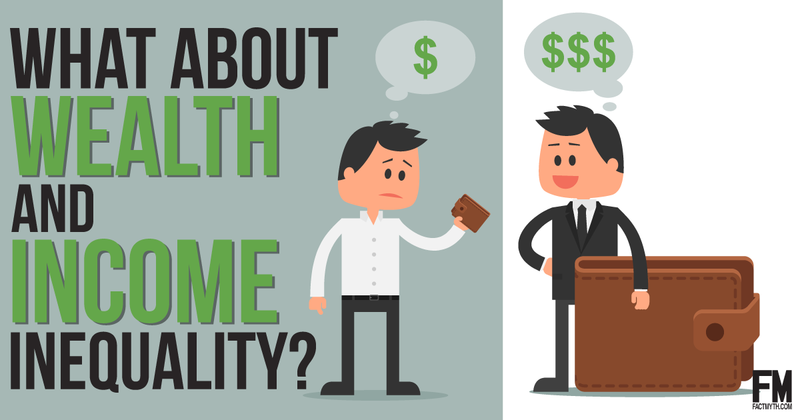 Income and Wealth Inequality: Crash Course Economics. A primer on equality by PBS. Income inequality breeds wealth inequality, which in-turn breeds social inequality in a society, which in-turn breeds injustice (as it begins to affect rights and liberties)… even in an otherwise just society (as what is just today doesn’t always lead to justice over time). Yet, despite this, the over-equalizing of society also breeds forms of injustice. Thus, the conversation is nuanced and complex. See the dangers of Communism and Fascism. If we don’t understand this slippery slope, and we don’t understand how to limit liberties in civil society to avoid economic injustice, we jeopardize our liberty, this is one reason why many nationally, and world-wide, call inequality one of the biggest threats to security. To understand that inequality is a threat to civil society, it’ll help to hear some legitimate sources comment on the phenomena. Given this reports by the Congressional Budget Office and a quote from Bill Gates are listed below. Understanding how income inequality leads to wealth inequality: To get a sense of how income inequality leads to wealth inequality over time consider the Congressional Budget Office report on Trends in the Distribution of Household Income Between 1979 and 2007 and The Distribution of Household Income and Federal Taxes, 2013 (from June 2016) and compare to it to Trends in Family Wealth, 1989 to 2013. We can see clearly, in America at least, the bottom has been lifted up, but the wealth and income gap is growing. Now pair this with the idea that the poor spend more while the rich save more, and the fact that the rich have tax breaks and investment income and assets that appreciate in value. You can see how over time this can lead to issues if unaddressed in a smart and fair way. See Trends in Income Distribution and Federal Taxes for more reports. QUOTE, Bill Gates talking about the highly respected Thomas Piketty’s Capital in the Twenty-First Century (Amazon) : “Yes, some level of inequality is built into capitalism. As Piketty argues, it is inherent to the system. The question is, what level of inequality is acceptable? And when does inequality start doing more harm than good? That’s something we should have a public discussion about, and it’s great that Piketty helped advance that discussion in such a serious way.” (AKA the another well-respected voice expressing the concept that inequality isn’t an issue is a talking point propagated by special interests). Today, on a global and national level, economic inequality (wealth and income inequality) is at an all-time high, and the gap is widening. Some poor are getting richer, some poor are getting poorer, but the rich are getting exponentially richer (and this creates a wealth gap). One effect of all this is that the poorest have more, and this is good, but another effect is the growing wealth disparities between the >.01% and <99.9%, which is bad. Wealth gaps have historically collapsed governments, which is a very real consequence. Wealth gaps also create economic injustice, which is bad in both a real and idealistic sense. See below, for instance when a country itself has a wealth gap to other countries, or when a wealth/power exists between the people spurring on a revolution of any flavor. NAZI Germany provides a good specific example of why economic injustice leads to political chaos (the WWI treaty led to hyper inflation, which led to Hitler). Economists recognize that a wealth gap could potentially collapse the economy on a global scale. Seeing the problem is simple for any historian or economist, but agreeing on a solution isn’t. A given solution isn’t just hard to come by, it is also the bane of monied interests (as a solution would likely involve prickly things like slowing the acquisition of capital and assets or affecting the distribution of capital and assets). Special interests aside, solutions are made increasingly convoluted by the sheer complexity of global markets and the entrenched aristocracy (power through bloodline or given by monarchs) and plutocracy (power through money) in many nations. Capitalism is a mechanism of liberty (see their parallel timelines), but capitalism is also the mechanism of oligarchs (aristocrats and plutocrats). We explain this all in more detail below. See forms of government for terms used in this paragraph. TIP: To understand more about inequality in America see inequality.org. This page does discuss statistics a bit, but our focus is on framing the history of politics in a light that will help you understand the importance of addressing inequality from a broader perspective. In other words, this isn’t a rant on modern times or a breakdown of last year’s statistics (see the links, videos, or CBO reports for that). Wealth inequality in the UK. Now let’s look at wealth inequality in the UK. Solon an Athenian statesman, lawmaker, and elegiac poet. One can be born into a class and have influence, or one can buy status and get influence. In both cases it is only ethics, morality, and law that keep society fair. The problem is that, with money, status, and power, one can buy the law (directly or via influence). This leaves us only with ethics and morality, and not everyone has this to the same degree. Adam Smith (the Father of Modern Economics) said we had to rely on “moral sentiment“, and once you understand Smith, you’ll know why we need a few laws to back morality up. Thus we can say, the only thing that truly protects the weak from the strong and the strong from themselves is the law. One of the biggest dangers for a just society is money and power creating “special interests” who use the law against the people, and amass wealth over time, to retain their position creating an “old money” aristocracy (see types of oligarchies). This concept can be summed up by looking at “inequality”, and specifically “wealth inequality”. If we are unequal enough in income and wealth, it can lead to inequality under law, and this has historically always led to oppression, and then revolution. The unequal distribution of assets within a population doesn’t just create powerful special interests and “indentured servants” directly due to those with power favoring their own special interests over others. It also creates despots who offer a cure only if we follow them, and also “angry mobs” who overthrow old governments. Despots and mob leaders typically become authoritative oligarchs themselves, and then create an aristocracy, only the start a new cycle again. If the scales of justice cannot be balanced through the channels of the press, speech, law, etc., they will find a way to balance themselves. History tells us that is almost always messy and violent. Below we will discuss inequality from Athens to today, look for advice from America’s founding fathers, and then try to put everything in perspective. This isn’t some idealistically Liberal call to redistribute wealth, rather it is a call to Conservatives, Moderates, and Capitalists who want to continue to enjoy the pursuit of economic wealth in a free Republic. A bank account or business is only as good as the country it’s in, so ultimately, ideology aside, we all have an interest in maintaining an economic and political balance. As we know instinctively, and as our founding fathers knew, “real liberty is neither found in despotism or the extremes of democracy, but in moderate governments”. This works as an analogy for economic systems and laws related to those systems as well. Wealth Inequality in Canada Broadbent Institute. Now wealth inequality for Canada. Long story short, this is a global problem. Do a YouTube (do a search for “unbiased wealth inequality”). TIP: A Republic is a nation where elected officials vote for laws, a Pure or Direct Democracy is when citizens vote directly, an Oligarchy is a nation ruled by a few special interests (aristocracy is a type of oligarchy). Learn more about Democracies, Republics, and Oligarchies here. Learn about the structure of the American government here,. Learn more about where basic governments stand on the left-right spectrum here. The Politics and Economics of Inequality. Professor Robert Reich examines what’s happened to income and wealth in this country, why it’s a problem, and what we can expect in future years. See Robert Reich’s movie Inequality for All (Amazon). Arguably, this video presents a “left” leaning point of view, if you have a smart “right” view leave it in the comments below. Income inequality is a problem in the world, but wealth inequality is the real danger. It is through wealth inequality that oligarchs and special interests can take control as the process typically happens over generations. This can be seen in landowners. A family buys land over time, through generations the acquire the majority of land, they now tax the people who live on the land, over time those taxed become indentured servants to the landowners, the wealthy landowners now exert their power in politics, and an oligarchy develops. The clustering of wealth among the few and the development of oligarchy has damaged many nations, as has war. However, wars are often won or lost over economic issues or the ability to unite a well-trained militia with high enough morale to defend their country. When people don’t have liberty, they are more likely to flee than to stand their ground (as without a gun to their back, what is it they are fighting for?). Commissars were directed to shoot their men in WWII in order to replace loyalty with fear. This is possibly one of the reasons why Rome fell as well, at their height rome was about 30% slaves and many non-slaves were of the lower classes. Interest Groups: Crash Course Government and Politics #42. TIP: Factions are small groups of people who use collective power to promote their special interests. Almost every government ever has fallen to factions and become an Oligarchy. As Oligarchs amass capital, they gather power. Thus income and wealth inequality are actually at the heart of humankind’s biggest sticking point. Luckily one of the greatest societies of all time, Athens, was built on a rebellion against oligarchs. We look at that below. Anyone who has studied history knows, the Oligarchs and special interests (factions) can and will try to usurp power by controlling capital and land, and thus the people. This is a natural effect of liberty, and since taking away liberty is not on the table, we have only a few solutions left. “Like fire is to air, liberty is to factions” – Madison Federalist #10 (playing off of Hamilton’s rant against factions in #9, factions are one of the major themes of the papers). A Republic. A nation ruled by law, ethics, and morality, rather than by Kings (Monarchies or Oligarchies) or Mob rule (Pure Democracy or Anarchy). When structured correctly and at the right size, a Republic alone allows the many to withstand the greed of the few. It is a Republican’s job to create laws that ensure equality. Rhetoric. One can’t prevent would-be oligarchs from existing in a nation that values liberty (although smart laws can curb behavior). So then, instead of trying to stop the oligarchs with force, the people must be empowered to fight for their interests, and thus to elect officials who will fight for them rather than be bought by the Oligarchs. This is accomplished by freedom of speech, freedom of the press, the elimination of debtors prisons, the promotion of education and “love of wisdom,” and other qualities that the American Republic aimed for. Many of these were pulled directly from Athens. (See tips on using rhetoric to defend the Republic). It is a Rhetorician’s job to persuade the people using correct philosophy, ethics, and reason. The above may seem radical, but Madison wasn’t some bleeding heart liberal, Madison was Democratic-Republican. He studied past governments and was just as critical about the “left-leaning” Athenian “Pure Democracy” as he was about the “right-leaning” Roman “Republic” (which was much more oligarchical and oppressive). (See the difference between left and right). With this in mind, let’s go to Athens for a moment and look at one of the first great governments in recorded history, the Athenian Democracy where so many of these ideals are rooted. We can trace this all the way to the start of Rome, and from Rome to the European Enlightenment, to today. Purdue OWL: Introduction to Rhetoric. NOTE: Almost all governments are mixed-constitution governments that employ elements of Democracy. This is true for America, Athens, Rome, and the current nations of the UK. America is a mixed-Republic with a mixed-market, and Athens was a mixed-Democracy. Pure Democracy and Republic are overly-simple titles that denote the voting style and ethics of the nations we are discussing. See: the History of wealth inequality and its historical effects for more reading.